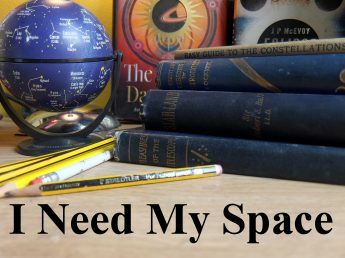 December | 2017 | I Need my Space! 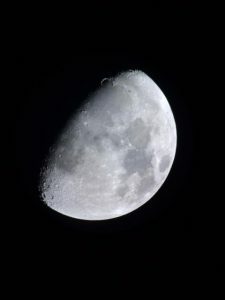 The last Moon of 2017? The Moon kept me company over my left shoulder as I walked up the Wrekin in Shropshire today. It was quite beautiful up there, and luckily, the clouds stayed away tonight, and I was able to do some lunar photography through my 8″ Skywatcher. Somehow, the Southern Highlands seem to be so much sharper than any details on Sinus Iridum. I’m wondering if it’s a collimation issue. Whatever, I’ve never had clearer photos of Clavius, so I’m pleased with tonight’s shots. I also took a minute of film, to try and stack the frames if I ever get my head around all the buttons and terminology on Autostacker and the rest. I decided to test the optics of the little Skywatcher Heritage 100 a couple of nights ago, and looked at the Trapezium. Under city skies with the 10mm eyepiece that came with the scope, I was just about able to see the fourth star. Yet I’ve read the trapezium is easily seen in a 3″ scope. I’m going to re-visit the Trapezium with the Heritage again as soon as possible and sketch it. Although I saw it from the city Monday night, I could still see the famous nebula and distinctive ‘fish-mouth’. There’s some excellent maps on this Sky & Telescope page. This morning’s Moon, and last week’s observations. The Trysull observation session was a great success. I’ve done a write up for the society newsletter, I’ll paste the text below. 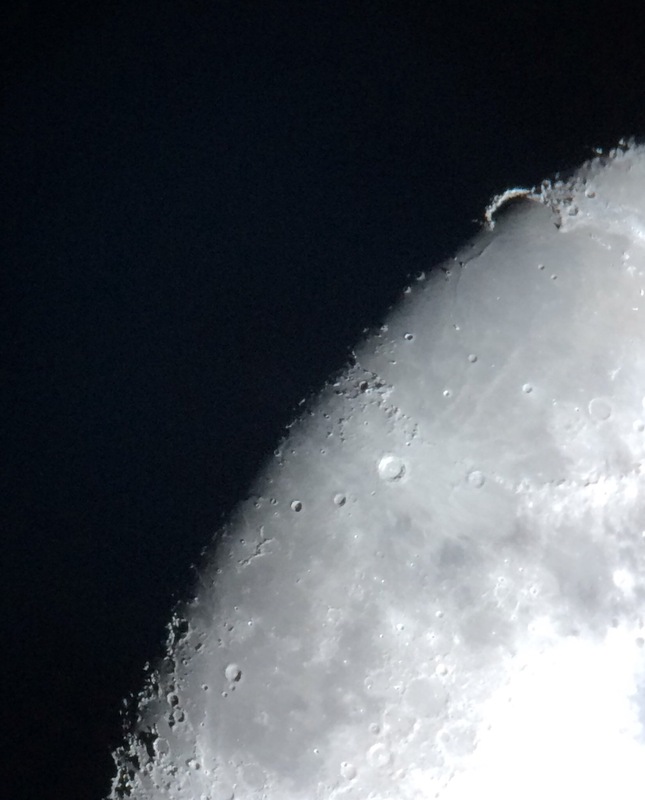 In the meantime, here’s the moon in the early hours of this morning through the little 4″ Skywatcher. I’m hoping to get another shot tonight. I haven’t got as many pictures of the waning moon. People started arriving at the Village Hall at 8pm. It was very encouraging to see such a good turnout. Around twenty astronomers of all ages and experience braved the crisp November night, and soon there was a row of telescopes set up, scanning the near-cloudless Trysull sky. Not everyone bought a telescope, but they didn’t need to. The telescopes there were used by everyone, and people drifted from scope to scope, looking at various cosmic sights, chatting about what they were looking at. It was a very friendly, convivial evening. At one point, as many as eight different telescopes of various sizes were in use on the large expanse of hard-standing behind the village hall. There are no direct street-lights behind the hall, and the adjoining field gave us a generous view of a low southern horizon. We were also joined by a waxing gibbous Moon in the south-west, 70% illuminated, affording wonderful telescopic views of the Bay of Rainbows, (Sinus Iridum), which was brightly sunlit across the peaks of Montes Jura, (as can be seen in Cath Adams’ fantastic Lunar photos from that evening). Closer observations of the Moon revealed a double central peak in crater Copernicus, and crater Reinhold, very distinct under the mountain range Montes Apenninus. The rugged southern highlands also made for some very interesting lunar observing. With the ‘Summer Triangle’ of stars Alatir, Deneb and Vega journeying westward, some observers took a look at the Ring Nebula M57 (a planetary nebula in Lyra), before it disappeared behind the Village Hall Roof. The double star Alberio, in Cygnus, was also observed, before it dipped in the west. The distinct colours of the two stars were easily recognisable. A bright golden star joined by a smaller, blue neighbour. Another double star, Polaris, was also ticked off by observers. With Orion rising in the east, early observations of the famous Orion Nebula (M42), proved tricky due to the distant haze from Wolverhampton, six miles away, and the low altitude of the constellation. We turned our attention to constellation of Auriga, and its splendid open clusters, M36, M37 and M38, all of which looked beautiful, and distinctly different from each other. 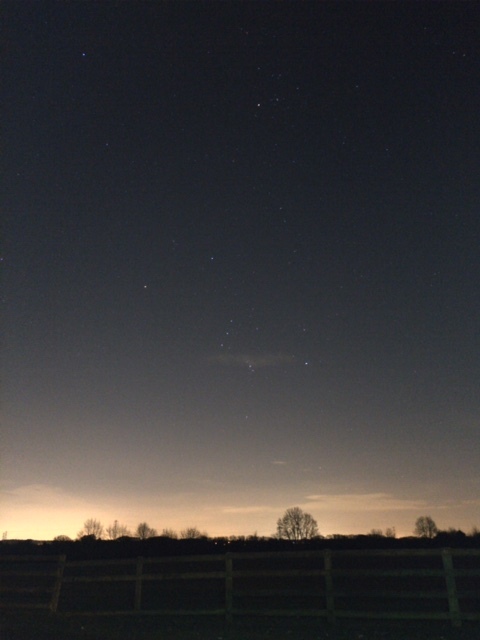 The circumpolar constellation of Cassiopeia was almost overhead by 10pm, and some ‘scopes were turned to its neighbouring constellation to look at the pretty double open cluster in Perseus. The open cluster of the Pleiades too, made for an excellent binocular object, as did the Hyades cluster, (the closest open cluster to our sun), in Taurus. Other deep sky objects observed were galaxies. M81 (Bode’s Galaxy), and its neighbour, the cigar-shaped M82. Both in Ursa Major. With the winter constellations of Taurus and Gemini rising, and Orion much higher in the sky, the Orion Nebula became a much better telescopic (and photographic) subject as the evening wore on. The great open cluster in Gemini (M35) was also observed. The village hall was open for people to nip in whenever they wanted, to use the toilets and have a tea or coffee and biscuits. A few people had bought sky maps and astronomy books, and it was good to have somewhere bright and warm to take a break. At the next session, there’ll be chairs set out for everyone too. 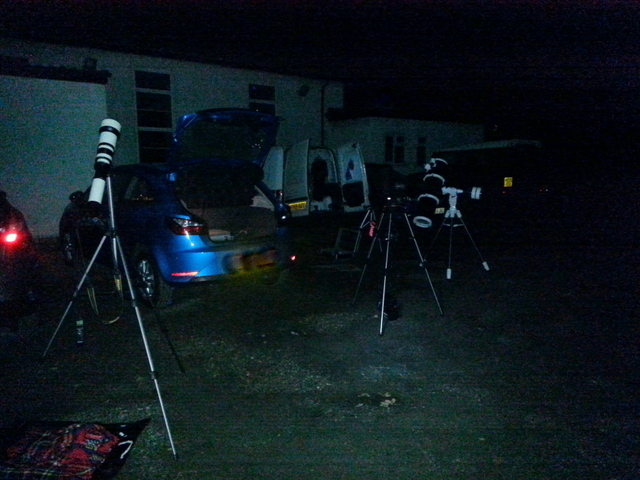 The evening was a great success, and we look forward to more observing sessions at Trysull village hall. Our sincere thanks go to the booking secretary Joe Harper for letting us use the venue, and thank you to the people that kindly put donations in the box towards the refreshments and room hire. If anyone wants to add their mobile number to the text alert system, just hand it to a committee member at the next meeting and we will put you on notification list.